Chinua Achebe (pronounced /ˈtʃɪnwɑː ɑːˈtʃeɪbeɪ/), born Albert Chinualumogu Achebe (November 16, 1930 - March 21, 2013) was a Nigerian novelist, poet and critic. He is best known for his first novel, Things Fall Apart (1958), which is the most widely-read book in modern African literature. Raised by Christian parents in the Igbo village of Ogidi in south Nigeria, Achebe excelled at school and won a scholarship for undergraduate studies. He became fascinated with world religions and traditional African cultures, and began writing stories as a university student. After graduation, he worked for the Nigerian Broadcasting Service and soon moved to the metropolis of Lagos. He gained worldwide attention for Things Fall Apart in the late 1950s. Achebe wrote his novels in English and has defended the use of English, a language of colonizers, in African literature. In 1975, his lecture "An Image of Africa: Racism in Conrad's Heart of Darkness" became the focus of controversy, for its criticism of Joseph Conrad as "a thoroughgoing racist." When the region of Biafra broke away from Nigeria in 1967, Achebe became a devoted supporter of the secession and ambassador for the people of the new nation. The war ravaged the populace, and as starvation and violence took its toll, he appealed to the people of Europe and the Americas for aid. When the Nigerian government retook the region in 1970, he involved himself in political parties but soon resigned due to frustration over the corruption and elitism he witnessed. Achebe's novels focus on the traditions of Igbo society, the effect of Christian influences, and the clash of values during and after the colonial era. His style relies heavily on the Igbo oral tradition, and combines straightforward narration with representations of folk stories, proverbs, and oratory. He has also published a number of short stories, children's books, and essay collections as well as serving as the Charles P. Stevenson Professor of Languages and Literature at Bard College in Annandale-on-Hudson, New York. Achebe's parents, Isaiah Okafo Achebe and Janet Anaenechi Iloegbunam, were converts to the Protestant Church Mission Society (CMS) in Nigeria. The elder Achebe stopped practicing the religion of his ancestors, but he respected its traditions and sometimes incorporated elements of its rituals into his Christian practice. Chinua's unabbreviated name, Chinualumogu ("May God fight on my behalf"), was a prayer for divine protection and stability. The Achebe family had five other surviving children, named in a similar fusion of traditional words relating to their new religion: Frank Okwuofu, John Chukwuemeka Ifeanyichukwu, Zinobia Uzoma, Augustine Nduka, and Grace Nwanneka. Chinua was born Albert Chinualumogu Achebe in the Igbo village of Nneobi, on November 16, 1930. His parents stood at a crossroads of traditional culture and Christian influence; this made a significant impact on the children, especially Chinualumogu. After the youngest daughter was born, the family moved to Isaiah Achebe's ancestral village of Ogidi, in what is now the Nigerian state of Anambra. 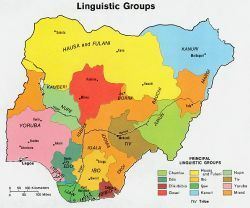 Map of Nigeria's linguistic groups. Achebe's homeland, the Igbo region (sometimes called Ibo), lies in the central south. Storytelling was a mainstay of the Igbo tradition and an integral part of the community. Chinua's mother and sister, Zinobia Uzoma, told him many stories as a child at his repeated requests. His education was furthered by the collages his father hung on the walls of their home, as well as almanacs and numerous books–including a prose adaptation of Shakespeare's A Midsummer Night's Dream (c. 1590) and an Igbo version of The Pilgrim's Progress (1678). Chinua also eagerly anticipated traditional village events, like the frequent masquerade ceremonies, which he recreated later in his novels and stories. In 1936 Achebe entered St. Philips' Central School. Despite his protests, he spent a week in the religious class for young children, but was quickly moved to a higher class when the school's reverend took note of his intelligence. He also attended Sunday school every week and the special evangelical services held monthly, often carrying his father's bag. A controversy erupted at one such session, when apostates from the new church challenged the catechist about the tenets of Christianity. Achebe later included a scene from this incident in Things Fall Apart. At the age of 12, Achebe moved away from his family to the village of Nekede, four kilometers from Owerri. He enrolled as a student at the Central School, where his older brother John taught. In Nekede, Achebe gained an appreciation for Mbari, a traditional art form which seeks to invoke the gods' protection through symbolic sacrifices in the form of sculpture and collage. When the time came to change to secondary school, in 1944, Achebe sat entrance examinations for and was accepted at both the prestigious Dennis Memorial Grammar School in Onitsha and the even more prestigious Government College in Umuahia. Modeled on the British public school, and funded by the colonial administration, Government College had been established in 1929 to educate Nigeria's future elite. It had rigorous academic standards and was vigorously egalitarian, accepting boys purely on the basis of ability. The language of the school was English, not only to develop proficiency but also to provide a common tongue for pupils from different Nigerian language groups. Achebe described this later as being ordered to "put away their different mother tongues and communicate in the language of their colonizers". The rule was strictly enforced and Achebe recalls that his first punishment was for asking another boy to pass the soap in Igbo. Once there, Achebe was double-promoted in his first year, completing the first two years' studies in one, and spending only four years in secondary school, instead of the standard five. Achebe was unsuited to the sports regimen of the school and belonged instead to a group of six exceedingly studious pupils. So intense were their study habits that the headmaster banned the reading of textbooks from five to six o'clock in the afternoon (though other activities and other books were allowed). Achebe started to explore the school's "wonderful library." There he discovered Booker T. Washington's Up From Slavery (1901), the autobiography of an American former slave; Achebe "found it sad, but it showed him another dimension of reality." He also read classic novels, such as Jonathan Swift's Gulliver's Travels (1726), Charles Dickens' David Copperfield (1850), and Robert Louis Stevenson's Treasure Island (1883) together with tales of colonial derring-do such as H. Rider Haggard's Allan Quatermain (1887) and John Buchan's Prester John (1910). Achebe later recalled that, as a reader, he "took sides with the white characters against the savages"and even developed a dislike for Africans. "The white man was good and reasonable and intelligent and courageous. The savages arrayed against him were sinister and stupid or, at the most, cunning. I hated their guts." In 1948, in preparation for independence, Nigeria's first university opened. Known as University College, (now the University of Ibadan), it was an associate college of the University of London. Achebe obtained such high marks in the entrance examination that he was admitted as a Major Scholar in the university's first intake and given a bursary to study medicine. After a year of grueling work, however, he decided science was not for him and he changed to English, history, and theology. Because he switched his field, however, he lost his scholarship and had to pay tuition fees. He received a government bursary, and his family also donated money; his older brother Augustine even gave up money for a trip home from his job as a civil servant so Chinua could continue his studies. From its inception, the university had a strong English faculty and it includes many famous writers among its alumni. These include Nobel Laureate Wole Soyinka, novelist Elechi Amadi, poet and playwright John Pepper Clark, and poet Christopher Okigbo. In 1950 Achebe wrote a piece for the University Herald entitled "Polar Undergraduate," his debut as an author. It used irony and humor to celebrate the intellectual vigor of his classmates. He followed this with other essays and letters about philosophy and freedom in academia, some of which were published in another campus magazine, The Bug. He served as the Herald's editor during the 1951–1952 school year. While at the university, Achebe wrote his first short story, "In a Village Church," which combines details of life in rural Nigeria with Christian institutions and icons, a style which appears in many of his later works. Other short stories he wrote during his time at Ibadan (including "The Old Order in Conflict with the New" and "Dead Men's Path") examine conflicts between tradition and modernity, with an eye toward dialogue and understanding on both sides. When a professor named Geoffrey Parrinder arrived at the university to teach comparative religion, Achebe began to explore the fields of Christian history and African traditional religions. It was during his studies at Ibadan that Achebe began to become critical of European literature about Africa. He read Irish novelist Joyce Cary's 1939 book Mister Johnson, about a cheerful Nigerian man who (among other things) works for an abusive British store owner. Achebe recognized his dislike for the African protagonist as a sign of the author's cultural ignorance. One of his classmates announced to the professor that the only enjoyable moment in the book is when Johnson is shot. After the final examinations at Ibadan in 1953, Achebe was awarded a second-class degree. Rattled by not receiving the highest result possible, he was uncertain how to proceed after graduation. He returned to his hometown of Ogidi to sort through his options. While he meditated on his possible career paths, Achebe was visited by a friend from the university, who convinced him to apply for an English teaching position at the Merchants of Light school at Oba. It was a ramshackle institution with crumbling infrastructure and a meager library; the school was built on what the residents called "bad bush"–a section of land thought to be tainted by unfriendly spirits. Later, in Things Fall Apart, Achebe describes a similar area called the "evil forest," where the Christian missionaries are given a place to build their church. As a teacher he urged his students to read extensively and be original in their work. The students did not have access to the newspapers he had read as a student, so Achebe made his own available in the classroom. He taught in Oba for four months, but when an opportunity arose in 1954 to work for the Nigerian Broadcasting Service (NBS), he left the school and moved to Lagos. The NBS, a radio network started in 1933 by the colonial government, assigned Achebe to the Talks Department, preparing scripts for oral delivery. This helped him master the subtle nuances between written and spoken language, a skill that helped him later to write realistic dialogue. The city of Lagos also made a significant impression on him. A huge conurbation, the city teemed with recent migrants from the rural villages. 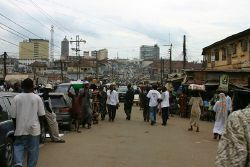 Achebe reveled in the social and political activity around him and later drew upon his experiences when describing the city in his 1960 novel No Longer At Ease. While in Lagos, Achebe started work on a novel. This was challenging, since very little African fiction had been written in English, although Amos Tutuola's Palm-Wine Drinkard (1952) and Cyprian Ekwensi's People of the City (1954) were notable exceptions. While appreciating Ekwensi's work, Achebe worked hard to develop his own style, even as he pioneered the creation of the Nigerian novel itself. A visit to Nigeria by Queen Elizabeth II in 1956 brought issues of colonialism and politics to the surface, and was a significant moment for Achebe. Also in 1956, Achebe was selected for training in London at the Staff School run by the British Broadcasting Corporation (BBC). His first trip outside Nigeria was an opportunity to advance his technical production skills, and to solicit feedback on his novel (which was later split into two books). In London he met a novelist named Gilbert Phelps, to whom he offered the manuscript. Phelps responded with great enthusiasm, asking Achebe if he could show it to his editor and publishers. Achebe declined, insisting that it needed more work. Back in Nigeria, Achebe set to work revising and editing his novel (now titled Things Fall Apart, after a line in the poem "The Second Coming" by William Butler Yeats). He cut away the second and third sections of the book, leaving only the story of a yam farmer named Okonkwo. He added sections, improved various chapters, and restructured the prose. By 1957 he had sculpted it to his liking, and took advantage of an advertisement offering a typing service. He sent his only copy of his handwritten manuscript (along with the ₤22 fee) to the London company. After he waited several months without receiving any communication from the typing service, Achebe began to worry. His boss at the NBS, Angela Beattie, was going to London for her annual leave; he asked her to visit the company. She did, and angrily demanded to know why it was lying ignored in the corner of the office. The company quickly sent a typed copy to Achebe. Beattie's intervention was crucial for his ability to continue as a writer. Had the novel been lost, he later said, "I would have been so discouraged that I would probably have given up altogether." In 1958 Achebe sent his novel to the literary agent recommended by Gilbert Phelps in London. It was sent to several publishing houses; some rejected it immediately, claiming that fiction from African writers had no market potential. Finally it reached the office of Heinemann, where executives hesitated until an educational adviser, Donald MacRae—just back in England after a trip through West Africa—read the book and forced the company's hand with his succinct report: "This is the best novel I have read since the war." 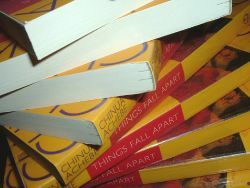 Heinemann published 2000 hardcover copies of Things Fall Apart released on June 17, 1958. According to Alan Hill, employed by the publisher at the time, the company did not "touch a word of it" in preparation for release. The book was received well by the British press, and received positive reviews from critic Walter Allen and novelist Angus Wilson. Three days after publication, the Times Literary Supplement wrote that the book "genuinely succeeds in presenting tribal life from the inside." The Observer called it "an excellent novel," and the literary magazine Time and Tide said that "Mr. Achebe's style is a model for aspirants." Initial reception in Nigeria was mixed. When Hill tried to promote the book in West Africa, he was met with skepticism and ridicule. The faculty at the University of Ibadan was amused at the thought of a worthwhile novel being written by an alumnus. Others were more supportive; one review in the magazine Black Orpheus said: "The book as a whole creates for the reader such a vivid picture of Ibo life that the plot and characters are little more than symbols representing a way of life lost irrevocably within living memory." In the book Okonkwo struggles with the legacy of his father—a shiftless debtor fond of playing the flute—as well as the complications and contradictions that arise when white missionaries arrive in his village of Umuofia. Exploring the terrain of cultural conflict, particularly the encounter between Igbo tradition and Christian doctrine, Achebe returns to the themes of his earlier stories, which grew from his own background. Things Fall Apart has become one of the most important books in African literature. Selling over 8 million copies around the world, it has been translated into 50 languages, making Achebe the most translated African writer of all time. In the same year Things Fall Apart was published, Achebe was promoted at the NBS and put in charge of the network's Eastern region coverage. He moved to Enugu and began to work on his administrative duties. There he met a woman named Christie Okoli, who had grown up in the area and joined the NBS staff when he arrived. They first conversed when she brought to his attention a pay discrepancy; a friend of hers found that, although they had been hired simultaneously, Christie had been rated lower and offered a lower wage. Sent to the hospital for an appendectomy soon afterwards, she was pleasantly surprised when Achebe visited her with gifts and magazines. Achebe and Okoli grew closer in the following years, and on September 10, 1961, were married in the Chapel of Resurrection on the campus of the University of Ibadan. Christie Achebe has described their marriage as one of trust and mutual understanding; some tension arose early in their union, due to conflicts about attention and communication. However, as their relationship matured, husband and wife made accommodations to adapt to one another. Their first child, a daughter named Chinelo, was born on July 11, 1962. They had a son, Ikechukwu, on December 3, 1964, and another boy named Chidi on May 24, 1967. When the children began attending school in Lagos, their parents became worried about the world view—especially with regard to race—expressed at the school, especially through the mostly white teachers and books that presented a prejudiced view of African life. In 1966, Achebe published his first children's book, Chike and the River, to address some of these concerns. After the Biafran secession and war, the Achebes had another daughter on March 7, 1970, named Nwando. In 1960, while they were still dating, Achebe dedicated to Christie Okoli his second novel, No Longer at Ease, about a civil servant who is embroiled in the corruption of Lagos. The protagonist is Obi, grandson of Things Fall Apart's main character, Okonkwo. Drawing on his time in the city, Achebe writes about Obi's experiences in Lagos to reflect the challenges facing a new generation on the threshold of Nigerian independence. Obi is trapped between the expectations of his family, its clan, his home village, and larger society. He is crushed by these forces (like his grandfather before him) and finds himself imprisoned for bribery. Having shown his acumen for portraying traditional Igbo culture, Achebe demonstrated in his second novel an ability to depict modern Nigerian life. Later that year, Achebe was awarded a Rockefeller Fellowship for six months of travel, which he called "the first important perk of my writing career"; Achebe set out for a tour of East Africa. One month after Nigeria achieved its independence, he travelled to Kenya, where he was required to complete an immigration form by checking a box indicating his ethnicity: European, Asiatic, Arab, or Other. Shocked and dismayed at being forced into an "Other" identity, he found the situation "almost funny" and took an extra form as a souvenir. Continuing to Tanganyika and Zanzibar (now united in Tanzania), he was frustrated by the paternalistic attitude he observed among non-African hotel clerks and social elites. Achebe also found in his travels that Swahili was gaining prominence as a major African language. Radio programs were broadcast in Swahili, and its use was widespread in the countries he visited. Nevertheless, he also found an "apathy" among the people toward literature written in Swahili. He met the poet Sheikh Shaaban Robert, who complained of the difficulty he had faced in trying to publish his Swahili-language work. In Northern Rhodesia (now called Zambia), Achebe found himself sitting in a whites-only section of a bus to Victoria Falls. Interrogated by the ticket taker as to why he was sitting in the front, he replied, "if you must know I come from Nigeria, and there we sit where we like in the bus." Upon reaching the waterfall he was cheered by the black travelers from the bus, but he was saddened by the irony that they felt unable to stand up to the policy of segregation. Two years later, Achebe again left Nigeria, this time as part of a Fellowship for Creative Artists awarded by UNESCO. He travelled to the United States and Brazil. He met with a number of writers from the U.S., including novelists Ralph Ellison and Arthur Miller. In Brazil, he met with several other authors, with whom he discussed the complications of writing in Portuguese. Achebe worried that the vibrant literature of the nation would be lost if left untranslated into a more widely-spoken language. Once he returned to Nigeria, Achebe was promoted at the NBS to the position of Director of External Broadcasting. One of his first duties was to help create the Voice of Nigeria network. The station broadcast its first transmission on New Year's Day 1962, and worked to maintain an objective perspective during the turbulent era immediately following independence. This objectivity was put to the test when Nigerian Prime Minister Abubakar Tafawa Balewa declared a state of emergency in the Western Region, responding to a series of conflicts between officials of varying parties. Achebe became saddened by the evidence of corruption and silencing of political opposition. In 1962 he attended a conference of African writers in English at the Makerere University College in Kampala, Uganda. He met with important literary figures from around the continent and the world, including Ghanaian poet Kofi Awoonor, Nigerian playwright and poet Wole Soyinka, and US poet-author Langston Hughes. Among the topics of discussion was an attempt to determine whether the term African literature ought to include work from the diaspora, or solely that writing composed by people living within the continent itself. Achebe indicated that it was not "a very significant question," and that scholars would do well to wait until a body of work were large enough to judge. Writing about the conference in several journals, Achebe hailed it as a milestone for the literature of Africa, and highlighted the importance of community among isolated voices on the continent and beyond. While at Makerere, Achebe was asked to read a novel written by a student (James Ngugi, later known as Ngugi wa Thiong'o) called Weep Not, Child. Impressed, he sent it to Alan Hill at Heinemann, which published it two years later to coincide with its paperback line of books from African writers. Hill indicated this was to remedy a situation where British publishers "regarded West Africa only as a place where you sold books." Achebe was chosen to be General Editor of the African Writers Series, which became a significant force in bringing postcolonial literature from Africa to the rest of the world. As these works became more widely available, reviews and essays about African literature—especially from Europe—began to flourish. Bristling against the commentary flooding his home country, Achebe published an essay titled "Where Angels Fear to Tread" in the December 1962 issue of Nigeria Magazine. In it, he distinguished between the hostile critic (entirely negative), the amazed critic (entirely positive), and the conscious critic (who seeks a balance). He lashed out at those who critiqued African writers from the outside, saying: "no man can understand another whose language he does not speak (and 'language' here does not mean simply words, but a man's entire world view)." Achebe's third book, Arrow of God, was published in 1964. Like its predecessors, it explores the intersections of Igbo tradition and European Christianity. Set in the village of Umuaro at the start of the twentieth century, the novel tells the story of Ezeulu, a Chief Priest of Ulu. Shocked by the power of British intervention in the area, he orders his son to learn the foreigners' secret. As with Okonkwo in Things Fall Apart and Obi in No Longer at Ease, Ezeulu is consumed by the resulting tragedy. The idea for the novel came in 1959, when Achebe heard the story of a Chief Priest imprisoned by a District Officer. He drew further inspiration a year later when he viewed a collection of Igbo objects excavated from the area by archaeologist Thurstan Shaw; Achebe was startled by the cultural sophistication of the artifacts. When an acquaintance showed him a series of papers from colonial officers (not unlike the fictional Pacification of the Primitive Tribes of the Lower Niger referenced at the end of Things Fall Apart), Achebe combined these strands of history and began work on Arrow of God in earnest. Like Achebe's previous works, Arrow was roundly praised by critics. A revised edition was published in 1974 to correct what Achebe called "certain structural weaknesses." In a letter to Achebe, the U.S. writer John Updike expressed his surprised admiration for the sudden downfall of Arrow of God's protagonist. He praised the author's courage to write "an ending few Western novelists would have contrived." Achebe responded by suggesting that the individualistic hero was rare in African literature, given its roots in communal living and the degree to which characters are "subject to non-human forces in the universe." A Man of the People was published in 1966. A bleak satire set in an unnamed African state which has just attained independence, the novel follows a Minister of Culture named Nanga. As the protagonist is seduced by corruption and the satisfaction of his personal desires, the nation around him falls victim to a military coup. Upon reading an advance copy of the novel, Achebe's friend John Pepper Clark declared: "Chinua, I know you are a prophet. Everything in this book has happened except a military coup!" One year later, Nigerian Major Chukwuma Kaduna Nzeogwu seized control of the northern region of the country as part of a larger coup attempt. Commanders in other areas failed, and the plot was answered by a military crackdown. A massacre of three thousand people from the eastern region living in the north occurred soon afterwards, and stories of other attacks on Igbo Nigerians began to filter into Lagos. The ending of his novel had brought Achebe to the attention of military personnel, who suspected him of having foreknowledge of the coup. When he received word of the pursuit, he sent his wife (who was pregnant) and children on a squalid boat through a series of unseen creeks to the Igbo stronghold of Port Harcourt. They arrived safely, but Christie suffered a miscarriage at the journey's end. Chinua rejoined them soon afterwards in Ogidi. These cities were safe from military incursion because they were in the southeast, part of the region which would later secede. Once the family had resettled in Enugu, Achebe and his friend Christopher Okigbo started a publishing house called Citadel Press, to improve the quality and increase the quantity of literature available to younger readers. One of its first submissions was a story called How the Dog was Domesticated, which Achebe revised and rewrote, turning it into a complex allegory for the country's political tumult. Its final title was How the Leopard Got His Claws. Years later a Nigerian intelligence officer told Achebe, "of all the things that came out of Biafra, that book was the most important." In May 1967 the southeastern region of Nigeria broke away to form the Republic of Biafra; in July the Nigerian military attacked to suppress what it considered an unlawful rebellion. Achebe's partner, Christopher Okigbo, who had become a close friend of the family (especially of Achebe's son, young Ikechukwu), volunteered to join the secessionist army while simultaneously working at the press. Achebe's house was bombed one afternoon; Christie had taken the children to visit her sick mother, so the only victims were his books and papers. The Achebe family narrowly escaped disaster several times during the war. Five days later, Christopher Okigbo was killed on the war's front line. Achebe was shaken considerably by the loss; in 1971 he wrote "Dirge for Okigbo," originally in the Igbo language but later translated to English. As the war intensified, the Achebe family was forced to leave Enugu for the Biafran capital of Aba. As the turmoil closed in, he continued to write, but most of his creative work during the war took the form of poetry. The shorter format was a consequence of living in a war zone. "I can write poetry," he said, "something short, intense more in keeping with my mood.… All this is creating in the context of our struggle." Many of these poems were collected in his 1971 book Beware, Soul Brother. One of his most famous, "Refugee Mother and Child," spoke to the suffering and loss that surrounded him. Dedicated to the promise of Biafra, he accepted a request to serve as foreign ambassador, refusing an invitation from the Program of African Studies at Northwestern University in Chicago. Achebe travelled to many cities in Europe, including London, where he continued his work with the African Writers Series project at Heinemann. During the war, relations between writers in Nigeria and Biafra were strained. Achebe and John Pepper Clark had a tense confrontation in London over their respective support for opposing sides of the conflict. Achebe demanded that the publisher withdraw the dedication of A Man of the People he had given to Clark. Years later, their friendship healed and the dedication was restored. Meanwhile, their contemporary Wole Soyinka was imprisoned for meeting with Biafran officials, and spent many years in jail. Speaking in 1968, Achebe said: "I find the Nigerian situation untenable. If I had been a Nigerian, I think I would have been in the same situation as Wole Soyinka is – in prison." The Nigerian government, under the leadership of General Yakubu Gowon, was backed by the British government; the two nations enjoyed a vigorous trade partnership. Addressing the causes of the war in 1968, Achebe lashed out at the Nigerian political and military forces that, to his mind, had forced Biafra to secede. He framed the conflict in terms of the country's colonial past. The writer in Nigeria, he said, "found that the independence his country was supposed to have won was totally without content.… The old white master was still in power. He had got himself a bunch of black stooges to do his dirty work for a commission." Conditions in Biafra worsened as the war continued. In September 1968, the city of Aba fell to the Nigerian military and Achebe once again moved his family, this time to Umuahia, where the Biafran government had also relocated. He was chosen to chair the newly formed National Guidance Committee, charged with the task of drafting principles and ideas for the post-war era. In 1969, the group completed a document entitled The Principles of the Biafran Revolution, later released as The Ahiara Declaration. In October of the same year, Achebe joined writers Cyprian Ekwensi and Gabriel Okara for a tour of the United States to raise awareness about the dire situation in Biafra. They visited 30 college campuses and conducted countless interviews. While in the southern U.S., Achebe learned for the first time of the "Igbo Landing," a true story of a group of Igbo captives who drowned themselves in 1803 – rather than endure the brutality of slavery – after surviving through the Middle Passage. Although the group was well-received by students and faculty, Achebe was "shocked" by the harsh realpolitik attitude toward Africa he saw in the US. At the end of the tour, he said that "world policy is absolutely ruthless and unfeeling". The beginning of 1970 saw the end of the state of Biafra. On January 12, the military surrendered to Nigeria, and Achebe returned with his family to Ogidi, where their home had been destroyed. He took a job at the University of Nigeria in Nsukka and immersed himself once again in academia. He was unable to accept invitations to other countries, however, because the Nigerian government revoked his passport due to his support for Biafra. After the war, Achebe helped start two magazines: the literary journal Okike, a forum for African art, fiction, and poetry; and Nsukkascope, an internal publication of the University (motto: "Devastating, Fearless, Brutal and True"). Achebe and the Okike committee later established another cultural magazine, Uwa Ndi Igbo, to showcase the indigenous stories and oral traditions of the Igbo community. In February 1972 he released Girls at War, a collection of short stories ranging in time from his undergraduate days to the recent bloodshed. It was the 100th book in Heinemann's African Writers Series. 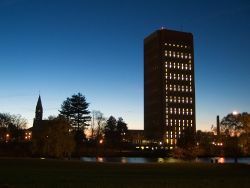 The University of Massachusetts Amherst offered Achebe a professorship later that year; the family moved to the United States. Their youngest daughter was displeased with her nursery school, and the family soon learned that her frustration involved language. Achebe helped her face the "alien experience" (as he called it) by telling her stories during the car trips to and from school. As he presented his lessons to a wide variety of students (he taught only one class, to a large audience), he began to study the perceptions of Africa in Western scholarship: "Africa is not like anywhere else they know … there are no real people in the Dark Continent, only forces operating; and people don't speak any language you can understand, they just grunt, too busy jumping up and down in a frenzy." Achebe expanded this criticism when he presented a Chancellor's Lecture at Amherst on February 18, 1975, titled "An Image of Africa: Racism in Conrad's Heart of Darkness." Decrying Joseph Conrad as "a thoroughgoing racist," Achebe asserts that Conrad's famous novel dehumanizes Africans, rendering Africa as "a metaphysical battlefield devoid of all recognizable humanity, into which the wandering European enters at his peril." Achebe also discussed a quote from Albert Schweitzer, a 1952 Nobel Peace Prize laureate: "The African is indeed my brother," he is reported to have said, "but my junior brother." Some were surprised that Achebe would challenge a man honored in the West for his "reverence for life," and recognized as a paragon of Western liberalism. The lecture caused a storm of controversy, even at the reception immediately following his talk. Many English professors in attendance were upset by his remarks; one elderly professor approached him, said: "How dare you! ", and stormed away. Another suggested that Achebe had "no sense of humor", but several days later Achebe was approached by a third professor, who told him "I now realize that I had never really read Heart of Darkness although I have taught it for years." Although the lecture angered many of his colleagues, he was nevertheless presented later in 1975 with an honorary doctorate from the University of Stirling and the Lotus Prize for Afro-Asian Writers. The first comprehensive rebuttal of Achebe's critique was published in 1983 by British critic Cedric Watts. His essay "A Bloody Racist: About Achebe's View of Conrad" defends Heart of Darkness as an anti-imperialist novel, suggesting that "part of its greatness lies in the power of its criticisms of racial prejudice." Palestinian-American theorist Edward Said agreed in his book Culture and Imperialism that Conrad criticized imperialism, but added: "As a creature of his time, Conrad could not grant the natives their freedom, despite his severe critique of the imperialism that enslaved them." Achebe's criticism has become a mainstream perspective on Conrad's work. The essay was included in the 1988 Norton critical edition of Conrad's novel. Editor Robert Kimbrough called it one of "the three most important events in Heart of Darkness criticism since the second edition of his book…." Critic Nicolas Tredell divides Conrad criticism "into two epochal phases: before and after Achebe." Asked frequently about his essay, Achebe once explained that he never meant for the work to be abandoned: "It's not in my nature to talk about banning books. I am saying, read it–with the kind of understanding and with the knowledge I talk about. And read it beside African works." When he returned to the University of Nigeria in 1976, he hoped to accomplish three goals: finish the novel he had been writing, renew the native publication of Okike, and further his study of Igbo culture. He also showed that he would not restrict his criticism to European targets. In an August 1976 interview, he lashed out at the archetypal Nigerian intellectual, who is divorced from the intellect "but for two things: status and stomach. And if there's any danger that he might suffer official displeasure or lose his job, he would prefer to turn a blind eye to what is happening around him." In October 1979, Achebe was awarded the first-ever Nigerian National Merit Award. 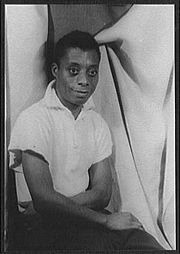 In 1980 he met James Baldwin at a conference held by the African Literature Association in Gainesville, Florida. The writers—with similar political perspectives, beliefs about language, and faith in the liberating potential of literature—were eager to meet one another. Baldwin said: "It's very important that we should meet each other, finally, if I must say so, after something like 400 years." In 1982, Achebe retired from the University of Nigeria. He devoted more time to editing Okike and also became active with the left-leaning People's Redemption Party (PRP). In 1983 he became the party's deputy national vice-president. He published a book called The Trouble with Nigeria to coincide with the upcoming elections. On the first page, Achebe says bluntly: "the Nigerian problem is the unwillingness or inability of its leaders to rise to the responsibility and to the challenge of personal example which are the hallmarks of true leadership." The elections that followed were marked by violence and charges of fraud. Asked whether he thought Nigerian politics had changed since A Man of the People, Achebe replied: "I think, if anything, the Nigerian politician has deteriorated." After the elections, he engaged in a heated argument—which almost became a fistfight—with Bakin Zuwo, the newly-elected governor of Kano State. He left the PRP and afterwards kept his distance from political parties, expressing his sadness at the dishonesty and weakness of the people involved. He spent most of the 1980s delivering speeches, attending conferences, and working on his sixth novel. He also continued winning awards and collecting honorary degrees. In 1986 he was elected president-general of the Ogidi Town Union; he reluctantly accepted and began a three-year term. In the same year, he stepped down as editor of Okike. In 1987 Achebe released his fifth novel, Anthills of the Savannah, about a military coup in the fictional West African nation of Kangan. A finalist for the prestigious Man Booker Prize, the novel was hailed in the Financial Times: "in a powerful fusion of myth, legend and modern styles, Achebe has written a book which is wise, exciting and essential, a powerful antidote to the cynical commentators from 'overseas' who see nothing ever new out of Africa." An opinion piece in the magazine West Africa said the book deserved to win the Booker Prize, and that Achebe was "a writer who has long deserved the recognition that has already been accorded him by his sales figures." The prize went instead to Penelope Lively's novel Moon Tiger. On March 22, 1990, Achebe was riding in a car to Lagos when an axle suddenly collapsed and the car flipped. His son Ikechukwu and the driver suffered minor injuries, but the weight of the vehicle fell on Achebe and his spine was severely damaged. He was flown to the Paddocks Hospital in Buckinghamshire, England, and treated for his injuries. In July doctors announced that although he was recuperating well, he was paralyzed from the waist down and would require the use of a wheelchair for the rest of his life. Soon afterwards, Achebe became the Charles P. Stevenson Professor of Languages and Literature at Bard College in Annandale-on-Hudson, New York; where he held the position for over 15 years. In the fall of 2009 he joined the Brown University faculty as the David and Marianna Fisher University Professor of Africana Studies. In October 2005, Financial Times reported that Achebe was planning to write a novella for the Canongate Myth Series, a series of short novels in which ancient myths from myriad cultures are reimagined and rewritten by contemporary authors. Achebe's novella has not yet been scheduled for publication. In June 2007, Achebe was awarded the Man Booker International Prize. The judging panel included U.S. critic Elaine Showalter, who said he "illuminated the path for writers around the world seeking new words and forms for new realities and societies"; and South African writer Nadine Gordimer, who said Achebe has achieved "what one of his characters brilliantly defines as the writer’s purpose: 'a new-found utterance' for the capture of life’s complexity". In 2010, Achebe was awarded The Dorothy and Lillian Gish Prize for $300,000, one of the richest prizes for the arts. Also in 2010, acollectionofachebesautobiographical essays were published under the title The Education of A British-Protected Child. In October 2012, Achebe's publishers, Penguin Books, released There Was a Country: A Personal History of Biafra. 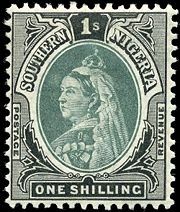 Publication immediately caused a stir and re-opened the discussion about the Nigerian Civil War. It would prove to be the last publication during his lifetime. Fondly called the "father of African literature", Achebe died after a short illness on March 21, 2013 in Boston, United States. Penguin publishing director Simon Winder said: "...we are all desolate to hear of his death." The New York Times described him in his obituary as "one of Africa's most widely read novelists and one of the continent's towering men of letters". The BBC wrote that he was "revered throughout the world for his depiction of life in Africa". He was laid to rest in his hometown in Ogidi, Anambra State. The style of Achebe's fiction draws heavily on the oral tradition of the Igbo people. He weaves folk tales into the fabric of his stories, illuminating community values in both the content and the form of the storytelling. The tale about the Earth and Sky in Things Fall Apart, for example, emphasizes the interdependency of the masculine and the feminine. Although Nwoye enjoys hearing his mother tell the tale, Okonkwo's dislike for it is evidence of his imbalance. Later, Nwoye avoids beatings from his father by pretending to dislike such "women's stories". Another hallmark of Achebe's style is the use of proverbs, which often illustrate the values of the rural Igbo tradition. He sprinkles them throughout the narratives, repeating points made in conversation. Critic Anjali Gera notes that the use of proverbs in Arrow of God "serves to create through an echo effect the judgment of a community upon an individual violation.…" The use of such repetition in Achebe's urban novels, No Longer at Ease and A Man of the People, is less pronounced. For Achebe, however, proverbs and folk stories are not the sum total of the oral Igbo tradition. In combining philosophical thought and public performance into the use of oratory ("Okwu Oka"—"speech artistry"—in the Igbo phrase), his characters exhibit what he called "a matter of individual excellence … part of Igbo culture." In Things Fall Apart, Okonkwo's friend Obierika voices the most impassioned oratory, crystallizing the events and their significance for the village. Nwaka in Arrow of God also exhibits a mastery of oratory, albeit for malicious ends. Achebe frequently includes folk songs and descriptions of dancing in his work. Obi, the protagonist of No Longer At Ease, is at one point met by women singing a "Song of the Heart," which Achebe gives in both Igbo and English: "Is everyone here? / (Hele ee he ee he)" In Things Fall Apart, ceremonial dancing and the singing of folk songs reflect the realities of Igbo tradition. The elderly Uchendu, attempting to shake Okonkwo out of his self-pity, refers to a song sung after the death of a woman: "For whom is it well, for whom is it well? There is no one for whom it is well." This song contrasts with the "gay and rollicking tunes of evangelism" sung later by the white missionaries. Achebe's short stories are not as widely studied as his novels, and Achebe himself does not consider them a major part of his work. In the preface for Girls at War and Other Stories, he writes: "A dozen pieces in twenty years must be accounted a pretty lean harvest by any reckoning." Like his novels, the short stories are heavily influenced by the oral tradition. And like the folktales they follow, the stories often have morals emphasizing the importance of cultural traditions. As the decolonization process unfolded in the 1950s, a debate about choice of language erupted and pursued authors around the world; Achebe was no exception. Indeed, because of his subject matter and insistence on a non-colonial narrative, he found his novels and decisions interrogated with extreme scrutiny–particularly with regard to his use of English. One school of thought, championed by Kenyan writer Ngugi wa Thiong'o, urged the use of indigenous African languages. English and other European languages, he said in 1986, were "part of the neo-colonial structures that repress progressive ideas". Achebe chose to write in English. In his essay "The African Writer and the English Language," he discusses how the process of colonialism—for all its ills—provided colonized people from varying linguistic backgrounds "a language with which to talk to one another." As his purpose is to communicate with readers across Nigeria, he uses "the one central language enjoying nationwide currency." Using English also allowed his books to be read in the colonial ruling nations. For an African writing in English is not without its serious setbacks. He often finds himself describing situations or modes of thought which have no direct equivalent in the English way of life. Caught in that situation he can do one of two things. He can try and contain what he wants to say within the limits of conventional English or he can try to push back those limits to accommodate his ideas.… I submit that those who can do the work of extending the frontiers of English so as to accommodate African thought-patterns must do it through their mastery of English and not out of innocence. In another essay, he refers to James Baldwin's struggle to use the English language to accurately represent his experience, and his realization that he needed to take control of the language and expand it. Nigerian poet and novelist Gabriel Okara likens the process of language-expansion to the evolution of jazz music in the United States. Achebe's novels laid a formidable groundwork for this process. By altering syntax, usage, and idiom, he transforms the language into a distinctly African style. In some spots this takes the form of repetition of an Igbo idea in standard English parlance; elsewhere it appears as narrative asides integrated into descriptive sentences. Achebe's novels approach a variety of themes. In his early writing, a depiction of the Igbo culture itself is paramount. Critic Nahem Yousaf highlights the importance of these depictions: "Around the tragic stories of Okonkwo and Ezeulu, Achebe sets about textualizing Igbo cultural identity." The portrayal of indigenous life is not simply a matter of literary background, he adds; "Achebe seeks to produce the effect of a precolonial reality as an Igbo-centric response to a Eurocentrically constructed imperial 'reality'.…" Certain elements of Achebe's depiction of Igbo life in Things Fall Apart match those in Oloudah Equiano's (c. 1745-1797) autobiographical Narrative. Responding to charges that Equiano was not actually born in Africa, Achebe wrote in 1975: "Equiano was an Ibo, I believe, from the village of Iseke in the Orlu division of Nigeria". A prevalent theme in Achebe's novels is the intersection of African tradition (particularly Igbo varieties) and modernity, especially as embodied by European colonialism. The village of Umuofia in Things Fall Apart, for example, is violently shaken with internal divisions when the white Christian missionaries arrive. Nigerian English professor Ernest N. Emenyonu describes the colonial experience in the novel as "the systematic emasculation of the entire culture." Achebe later embodied this tension between African tradition and Western influence in the figure of Sam Okoli, the president of Kangan in Anthills of the Savannah. Distanced from the myths and tales of the community by his Westernized education, he does not have the capacity for reconnection shown by the character Beatrice. The colonial impact on the Igbo in Achebe's novels is often effected by individuals from Europe, but institutions and urban offices frequently serve a similar purpose. The character of Obi in No Longer at Ease succumbs to colonial-era corruption in the city; the temptations of his position overwhelm his identity and fortitude. The courts and the position of District Commissioner in Things Fall Apart likewise clash with the traditions of the Igbo, and remove their ability to participate in structures of decision-making. The standard Achebean ending results in the destruction of an individual and, by synecdoche, the downfall of the community. Odili's descent into the luxury of corruption and hedonism in A Man of the People, for example, is symbolic of the post-colonial crisis in Nigeria and elsewhere. Even with the emphasis on colonialism, however, Achebe's tragic endings embody the traditional confluence of fate, individual and society, as represented by Sophocles and Shakespeare. Still, Achebe seeks to portray neither moral absolutes nor a fatalistic inevitability. In 1972, he said: "I never will take the stand that the Old must win or that the New must win.… The point is that no single truth satisfied me–and this is well founded in the Ibo world view. No single man can be correct all the time, no single idea can be totally correct." His perspective is reflected in the words of Ikem, a character in Anthills of the Savannah: "whatever you are is never enough; you must find a way to accept something, however small, from the other to make you whole and to save you from the mortal sin of righteousness and extremism." And in a 1996 interview, Achebe said: "Belief in either radicalism or orthodoxy is too simplified a way of viewing things.… Evil is never all evil; goodness on the other hand is often tainted with selfishness." The gender roles of men and women, as well as societies' conceptions of the associated concepts, are frequent themes in Achebe's writing. He has been criticized as a sexist author, in response to what many call the uncritical depiction of traditionally patriarchal Igbo society, where the most masculine men take numerous wives, and women are beaten regularly. Others suggest that Achebe is merely representing the limited gendered vision of the characters, and they note that in his later works, he tries to demonstrate the inherent dangers of excluding women from society. In Things Fall Apart, Okonkwo's furious manhood overpowers everything feminine in his life, including his own conscience. For example, when he feels bad after killing his adopted son, he asks himself: "When did you become a shivering old woman?" He views all things feminine as distasteful, in part because they remind him of his father's laziness and cowardice. The women in the novel, meanwhile, are obedient, quiet, and absent from positions of authority–despite the fact that Igbo women were traditionally involved in village leadership. Nevertheless, the need for feminine balance is highlighted by Ani, the earth goddess, and the extended discussion of "Nneka" ("Mother is supreme") in chapter 14. Okonkwo's defeat is seen by some as a vindication of the need for a balancing feminine ethos. Achebe's first central female character in a novel is Beatrice Nwanyibuife in Anthills of the Savannah. As an independent woman in the city, Beatrice strives for the balance which Okonkwo lacked so severely. She refutes the notion that she needs a man, and slowly learns about Idemili, a goddess balancing the aggression of male power. Although the final stages of the novel show her functioning in a nurturing mother-type role, Beatrice remains firm in her conviction that women should not be limited to such capacities. Achebe has been called "the father of modern African writing," and many books and essays have been written about his work over the past 50 years. In 1992 he became the only living author represented in the Everyman's Library collection published by Alfred A. Knopf. His sixtieth birthday was celebrated at the University of Nigeria by "an international Who's Who in African Literature." One observer noted: "Nothing like it had ever happened before in African literature anywhere on the continent." Many writers of succeeding generations view his work as having paved the way for their efforts. In 1982 he was awarded an honorary degree from the University of Kent. At the ceremony, professor Robert Gibson said that the Nigerian author "is now revered as Master by the younger generation of African writers and it is to him they regularly turn for counsel and inspiration." Even outside of Africa, his impact resonates strongly in literary circles. Novelist Margaret Atwood called him "a magical writer–one of the greatest of the twentieth century." Poet Maya Angelou lauded Things Fall Apart as a book wherein "all readers meet their brothers, sisters, parents and friends and themselves along Nigerian roads." Nelson Mandela, recalling his time as a political prisoner, once referred to Achebe as a writer "in whose company the prison walls fell down." Achebe is the recipient of over 30 honorary degrees from universities in England, Scotland, Canada, South Africa, Nigeria and the United States, including Dartmouth College, Harvard University, and Brown University. He has been awarded the Commonwealth Poetry Prize, an Honorary Fellowship of the American Academy of Arts and Letters, the Nigerian National Order of Merit (Nigeria's highest honor for academic work), and the Peace Prize of the German Book Trade. Some scholars have suggested that Achebe has been shunned by intellectual society for criticizing Conrad and traditions of racism in the West. Despite his scholarly achievements and the global importance of his work, Achebe has never received a Nobel Prize, which some observers view as unjust. The Nobel Committee has been often criticized for overlooking important writers, such as Jorge Luis Borges, W. H. Auden, Vladimir Nabokov and Leo Tolstoy. When Wole Soyinka won the Nobel Prize in 1986, Achebe joined the rest of Nigeria in celebrating the first African ever to win the prize. He lauded Soyinka's "stupendous display of energy and vitality," and said he was "most eminently deserving of any prize." In 1988 Achebe was asked by a reporter for Quality Weekly how he felt about never winning a Nobel prize; he replied: "My position is that the Nobel Prize is important. But it is a European prize. It's not an African prize.… Literature is not a heavyweight championship. Nigerians may think, you know, this man has been knocked out. It's nothing to do with that." ↑ 1.0 1.1 Ezenwa-Ohaeto. Chinua Achebe: A Biography. (Bloomington: Indiana University Press, 1997. ISBN 0253333423), 6. ↑ Kalu Ogbaa. Understanding Things Fall Apart. (Westport, CT: Greenwood Press, 1999. ISBN 0313302944), xv. ↑ Ezenwa-Ohaeto. Chinua Achebe: A Biography. (Bloomington: Indiana University Press, 1997. ISBN 0253333423), 3. ↑ 4.0 4.1 4.2 4.3 Ezenwa-Ohaeto, 7. ↑ Chinua Achebe. Things Fall Apart. New York: Anchor Books, (original 1958)1994. ISBN 03854745471994), 146-147. ↑ 12.0 12.1 12.2 Ezenwa-Ohaeto, 22-23. ↑ 13.0 13.1 Ezenwa-Ohaeto, 30. ↑ Quoted in Ezenwa-Ohaeto, 30. ↑ 16.0 16.1 Ezenwa-Ohaeto, 26-27. ↑ 17.0 17.1 17.2 Quoted in Ezenwa-Ohaeto, 26-27. ↑ Robert W. July. An African Voice. (Durham, NC: Duke University Press, 1987. ISBN 0822307693), 64; Margaret Laurence. Long Drums and Cannons: Nigerian Dramatists and Novelists, 1952-1966. (Alberta: University of Alberta Press, 2001. ISBN 0888643322), viii. ↑ Achebe, 1958/1994. The "evil forest" is a place where twins (considered an abomination by the community) are thrown away to die. When the Christian missionaries persevere despite their location, they are able to convince some in the community that the superstition is unwarranted. ↑ Federal Radio Corporation of Nigeria. "About Us". Online at Radio Nigeria Online. Retrieved on 15 October 2007. ↑ Alan Hill, 1991. Quoted in Petersen, reprinted in Ezenwa-Ohaeto, 65. ↑ Quoted in Ezenwa-Ohaeto, 65. ↑ Quoted in Ezenwa-Ohaeto, 65–66. ↑ Quoted in Ezenwa-Ohaeto, 79. ↑ Quoted in Ezenwa-Ohaeto, 81. ↑ Quoted in Ezenwa-Ohaeto, 83. ↑ Quoted in Ezenwa-Ohaeto, 89. ↑ Quoted in Ezenwa-Ohaeto, 105. ↑ Quoted in Ezenwa-Ohaeto, 106. ↑ Quoted in Ezenwa-Ohaeto, 154. ↑ Quoted in Ezenwa-Ohaeto, 149. ↑ Quoted in Ezenwa-Ohaeto, 137. ↑ Nahem Yousaf. Chinua Achebe. (Tavistock: Northcote House in Association with the British Council, 2003. ISBN 074630885X), 88. ↑ Timothy B. Powell. 2004. "Ebos Landing". The New Georgia Encyclopedia. Retrieved December 14, 2007. ↑ Quoted in Ezenwa-Ohaeto, 150. ↑ Quoted in Ezenwa-Ohaeto, 174. ↑ Chinua Achebe. Hopes and Impediments: Selected Essays. (New York: Doubleday, 1989. ISBN 0385247303), 8. ↑ Albert Schweitzer, 1936. "Reverence for Life". Online at Association Internationale Albert Schweitzer. Retrieved December 14, 2007. ↑ 106.0 106.1 Quoted in Ezenwa-Ohaeto, 191. ↑ Cedric Watts, "A Bloody Racist: About Achebe's View of Conrad." The Yearbook of English Studies 13 (1983): 196-209. ↑ Quoted in William Atkinson, "Bound in Blackwood's: The Imperialism of 'The Heart of Darkness' in Its Immediate Context." Twentieth Century Literature 50 (4)(January 2004): 368. ↑ 111.0 111.1 Quoted in Ezenwa-Ohaeto, 259. ↑ Nicholas Tredell. Joseph Conrad: Heart of Darkness. (New York: Columbia University Press, 2000. ISBN 0231119232), 71. ↑ Quoted in Ezenwa-Ohaeto, 197. ↑ Quoted in Ezenwa-Ohaeto, 214. ↑ 121.0 121.1 Quoted in Ezenwa-Ohaeto, 253. ↑ Angel Gurria-Quintana, "Myth understood", Financial Times, 2005-10-28. Retrieved on 2007-11-07. ↑ "Nigeria author wins Booker honor", June 13, 2007. BBC News Online. Retrieved on 23 September 2007. ↑ 125.0 125.1 125.2 The Booker Prize Foundation, June 13, 2007. "The father of modern African writing, wins 2007 Man Booker International Prize". Online at The Man Booker International Prize. Retrieved on 11 October 2007. ↑ Recipients Gish Prize. Retrieved March 10, 2016. ↑ 127.0 127.1 Idris Akinbajo, Prof Chinua Achebe is dead Premium Times, March 22, 2013. Retrieved March 10, 2016. ↑ Ben Frederick, "Chinua Achebe is remembered as the 'father of modern African literature'", The Christian Science Monitor, March 22, 2013. ↑ Alison Flood, Novelist Chinua Achebe dies, aged 82 The Guardian March 22, 2013. Retrieved March 10, 2016. ↑ Jonathan Kandell, Chinua Achebe, African Literary Titan, Dies at 82 The New York Times, March 22, 2013. Retrieve March 10, 2016. ↑ Chinua Achebe: Obituary of Nigeria's renowned author BBC News, March 22, 2013. Retrieved March 10, 2016. ↑ A Legend Goes Home! Chinua Achebe buried in His Home Town, Ogidi in Anambra State Bella Naija, May 24, 2013. Retrieved March 10, 2016. ↑ 136.0 136.1 Anjali Gera. Three Great African Novelists. (New Delhi: Creative Books, 2001. ISBN 8186318798), 32. ↑ Quoted in Phanuel Egejuru, "Orethory Okwu Oka: A Neglected Technique In Achebe's Literary Artistry." In Ihekweazu, 1996, 394. ↑ Quoted in Gera, 25. ↑ Quoted in Willfried F. Feuser, "Nothing Puzzles God! ": Chinua Achebe's Civil War Stories" No Condition Is Permanent: Nigerian Writing and the Struggle for Democracy, Holger G. Ehling and Claus-Peter Holste-von Mutius, eds. (Amsterdam; and New York: Editions Rodopi, 2001), 65. Retrieved December 14, 2007. ↑ Ode Ogede, "Oral Tradition and Modern Storytelling: Revisiting Chinua Achebe's Short Stories." International Fiction Review 28 (1/2)(January 2001): 67–77. ISSN 0315-4149. ↑ Quoted in Ezenwa-Ohaeto, 246. ↑ Quoted in Ogbaa, 193. ↑ Virginia Azohu, "Culture and the Frontiers of Language." In Edith Ihekweazu. Eagle on Iroko: Selected Papers from the Chinua Achebe International Symposium, 1990. (Ibadan, Nigeria: Heinemann Educational Books (Nigeria) PLC, 1996. ISBN 9781293799), 413. ↑ Rose Ure Mezu. Chinua Achebe: The Man and His Works. (London: Adonis & Abbey Publishers Ltd., 2006. ISBN 1905068212), 164–207. ↑ Charles Nnolim, "The Artist in Search of The Right Leadership: Achebe As A Social Critic." In Ihekweazu, 1996, 173. ↑ Alistair Niven, "Chinua Achebe and the Possibility of Modern Tragedy." In Kirsten Holst Peterson and Anna Rutherford, eds. Chinua Achebe: A Celebration. (Oxford, England: Dangeroo Press, 1991. ISBN 0435080601), 46–47. ↑ Quoted in Bernth Lindfors. Early Nigerian Literature. (New York: Holmes & Meier Publishers, Ltd., 1982. ISBN 0841907404), 101–102. ↑ Quoted in Mezu, 132. ↑ Quoted in Ezenwa-Ohaeto, 224. ↑ Quoted in Ezenwa-Ohaeto, 283. ↑ Maya Jaggi, "The unseen literary world". The Guardian. Online at Guardian Unlimited, (14 June 2007). Retrieved on 19 September 2007. ↑ Oseloka Obaze, (14 October 2006). "Chinua Achebe: The unacknowledged Nobel laureate". Online at kwenu.com. Retrieved on 24 September 2007. ↑ Henry Akubuiro, "Chinua Achebe deserves Nobel Prize". Sun News (Nigeria), October 1, 2006. Retrieved on 24 September 2007. ↑ Quoted in Ezenwa-Ohaeto, 250. ↑ Quoted in Ezenwa-Ohaeto, 263–264. Achebe, Chinua, "English and the African Writer." Transition 18 (1965): 27-30. ISSN 0041-1191. Achebe, Chinua. Morning Yet on Creation Day. London: Heinemann Educational, 1975. ISBN 0435180266. Achebe, Chinua. Hopes and Impediments: Selected Essays. New York: Doubleday, 1989. ISBN 0385247303. Achebe, Chinua. Things Fall Apart. New York: Anchor Books, 1994. ISBN 0385474547. Atkinson, William, "Bound in Blackwood's: The Imperialism of 'The Heart of Darkness' in Its Immediate Context." Twentieth Century Literature 50 (4)(January 2004): 368. Azohu, Virginia, "Culture and the Frontiers of Language." In Edith Ihekweazu. Eagle on Iroko: Selected Papers from the Chinua Achebe International Symposium, 1990. Ibadan, Nigeria: Heinemann Educational Books (Nigeria) PLC, 1996. ISBN 9781293799. Bicknell, Catherine, "Achebe's Women: Mothers, Priestesses, And Young Urban Professionals." In Edith Ihekweazu. Eagle on Iroko: Selected Papers from the Chinua Achebe International Symposium, 1990. Ibadan, Nigeria: Heinemann Educational Books (Nigeria) PLC, 1996. ISBN 978-1293799. Booker, M. Keith, and Simon Gikandi. The Chinua Achebe Encyclopedia. Westport, CT: Greenwood Press, 2003. ISBN 0325070636. Egar, Emmanuel Edame. The Rhetorical Implications of Chinua Achebe's 'Things Fall Apart' Lanham, MD: University Press of America, 2000. ISBN 0761817212. Egejuru, Phanuel, "Orethory Okwu Oka: A Neglected Technique In Achebe's Literary Artistry." In Ihekweazu, 1996. Egejuru, Phanuel Akubueze. Chinua Achebe: Pure and Simple, an Oral Biography. Stoke-on-Trent: Malthouse Press, 2001. ISBN 978-023148X. Ekwe-Ekwe, Herbert. African Literature in Defence of History: An Essay on Chinua Achebe. Dakar: African Renaissance, 2001. ISBN 1903625106. Emenyonu, Ernest N. "Chinua Achebe's Things Fall Apart: A Classic Study in Colonial Diplomatic Tactlessness." In Kirsten Holst Peterson and Anna Rutherford (eds.). Chinua Achebe: A Celebration. Oxford, UK: Dangeroo Press, 1991. ISBN 0435080601. Emenyonu, Ernest N., "Foreword: For Whom The Honour Is Due." In Ihekweazu, 1996. Emenyonu, Ernest N., Ed. Emerging Perspectives on Chinua Achebe. Trenton, NJ: Africa World Press, 2004. ISBN 0865438765 (v. 1), ISBN 0865438781 (v. 2). 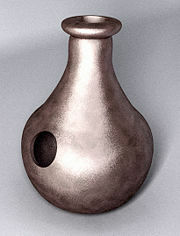 Ezenwa-Ohaeto. Chinua Achebe: A Biography. Bloomington: Indiana University Press, 1997. ISBN 0253333423. Feuser, Willfried F. "Nothing Puzzles God! ": Chinua Achebe's Civil War Stories" in No Condition Is Permanent: Nigerian Writing and the Struggle for Democracy, Holger G. Ehling and Claus-Peter Holste-von Mutius (eds.). Amsterdam; and New York: Editions Rodopi. Gera, Anjali. Three Great African Novelists. New Delhi: Creative Books, 2001. ISBN 8186318798. Gikandi, Simon. Reading Chinua Achebe: Language and Ideology in Fiction. London: J. Currey, 1991. ISBN 085255527X. Hafkin, Nancy J., and Edna G. Bay, eds. Women in Africa. Stanford University Press, 1976. ISBN 0804710112. Ihekweazu, Edith. Eagle on Iroko: Selected Papers from the Chinua Achebe International Symposium, 1990. Ibadan, Nigeria: Heinemann Educational Books (Nigeria) PLC, 1996. ISBN 9781293799. Innes, Catherine Lynette. Chinua Achebe. Cambridge, UK: Cambridge University Press, 1978. ISBN 978-0521356237. Innes, C. L., and Bernth Lindfors, Eds. Critical Perspectives on Chinua Achebe. Washington: Three Continents Press, 1990. ISBN 0914478451. July, Robert W. An African Voice. Durham, NC: Duke University Press, 1987. ISBN 0822307693. Killam, G. D. The Writings of Chinua Achebe. London: Heinemann Educational, 1977. ISBN 0435916653. Laurence, Margaret. Long Drums and Cannons: Nigerian Dramatists and Novelists, 1952-1966. Alberta: University of Alberta Press, 2001. ISBN 0888643322. Lindfors, Bernth. Early Nigerian Literature. New York: Holmes & Meier Publishers, Ltd., 1982. ISBN 0841907404. Mezu, Rose Ure. Chinua Achebe: The Man and His Works. London: Adonis & Abbey Publishers Ltd., 2006. ISBN 1905068212. Niven, Alistair, "Chinua Achebe and the Possibility of Modern Tragedy." In Kirsten Holst Peterson and Anna Rutherford, eds. Chinua Achebe: A Celebration. Oxford, England: Dangeroo Press, 1991. ISBN 0435080601. Njoku, Benedict Chiaka. The Four Novels of Chinua Achebe: A Critical Study, New York: P. Lang, 1984. ISBN 0820401544. Nnolim, Charles, "The Artist in Search of The Right Leadership: Achebe As A Social Critic." In Ihekweazu, 1996. Ogbaa, Kalu. Understanding Things Fall Apart. Westport, CT: Greenwood Press, 1999. ISBN 0313302944. Ogede, Ode. Achebe and the Politics of Representation: Form Against Itself, From Colonial Conquest and Occupation to Post-Independence Disillusionment. Trenton, NJ: Africa World Press, 2001. ISBN 0865437742. Ojinmah, Umelo. Chinua Achebe: New Perspectives. Ibadan: Spectrum Books Limited, 1991. ISBN 978-2461164. Okpewho, Isidore, Ed. Chinua Achebe's 'Things Fall Apart': A Casebook. Oxford, England: Oxford University Press, 2003. ISBN 0195147634. Sallah, Tijan M., and Ngozi Okonjo-Iweala. Chinua Achebe, Teacher of Light: A Biography. Trenton, NJ: Africa World Press, 2003. ISBN 1592210317. Tredell, Nicolas. Joseph Conrad: Heart of Darkness. New York: Columbia University Press, 2000. ISBN 0231119232. Watts, Cedric, "A Bloody Racist: About Achebe's View of Conrad." The Yearbook of English Studies 13 (1983): 196-209. Yankson, Kofi E. Chinua Achebe's Novels: A Sociolinguistic Perspective. Uruowulu-Obosi, Nigeria: Pacific Publishers, 1990. ISBN 978-2347795. Yousaf, Nahem. Chinua Achebe. Tavistock: Northcote House in Association with the British Council, 2003. ISBN 074630885X. This page was last modified on 15 February 2017, at 15:32.